"Our mission isn't necessarily to provide you with a mattress. Our mission is to contribute to your quality of life. We just happen to have chosen mattresses a vehicle to do that." Seanan: The bottom line for me is: Why Savvy Rest is because it's comfortable. It's physically comfortable, and to a certain extent, it's mentally comforting in a world like this today. Lay Lwin: At Savvy Rest, we offer two different types of natural latex in three different densities. This allows you and your partner to customize each side of the mattress. With Savvy Rest mattresses, customers also have the option of doing a 90-day latex exchange period. With this, if you end up going home with a mattress that ends up feeling too soft or too firm for you, you have those 90 days to switch out the densities for free. Dominick: We all get older and things change in our bodies, so if you sustain an injury or if you've had to have a surgery or if something just changes in terms of what's comfortable to you, you can always buy a new layer of a different density and rebuild your mattress. And this is significantly less costly than buying a whole brand new mattress. John: So there's a lot of customization; it's almost unparalleled in the industry. You're going to spend a third of your life on this product, so ideally it's going to be one that made with high-quality craftsmanship so it will last a long time and keep you comfortable for the duration of that time you own the product. Michael: And so the idea of being able to adjust the softness or firmness of a mattress after somebody had it just made complete sense to me. John: We know that there's plenty of toxic chemicals in the environment, and many of these are in the mattresses that are in the traditional mattress industry. So it's our goal to offer products that don't feature these chemicals, that people could feel comfortable with. They can feel safe knowing that they were sleeping on a Savvy Rest mattress. Michael: And so it was really important to me early on to have third-party independent verification. Seanan: We wanted to do this in a way where we could have confidence that what we were putting into the products, and what we were telling people we were putting into the products, was something we could really stand behind. Dominick: Our mattresses are made with 100% certified organic cotton and certified organic wool. Let me be clear about that: We're not "made with" organic cotton, so it's not made with organic cotton and then a blend of other fibers. It's 100% certified organic cotton and 100% certified organic wool. Seanan: And when it comes to the rubber: The thought that the core of the bed is actually coming from sap that's harvested from trees is mind-melting. Dominick: So you can't really get any purer foam than a natural latex foam. John: For Dunlop latex, the GOLS standard is really the industry leader. It stands for Global Organic Latex Standard. And our Talalay latex comes from rubber tree plantations that adhere to sustainable forestry practices. This means the latex farms are being run sustainably in a way that benefits local communities and the rainforests are being protected. GOTS is a standard that was established years ago for the textile industry and has recently become the standard for organic mattresses. The GOTS standard applies to so many workers around the world, whether it's those who herd sheep, whether it's those who run latex farms, whether it's those who work in cotton. It affects these local communities and the standards are designed to support the welfare of the communities where the suppliers come from, the animals, the plantations, the farms...so it goes beyond just us. Seanan: It's all about what kind of footprint do the materials we're using have on the surface of the earth. John: Beyond that, we've gone ahead and had our facilities certified organic and the finished mattresses certified organic. This sets us apart from everyone else in the industry. Judd: One of the big things, too, is that we do everything with solid hardwood. So, all our hardwood comes from Appalachian sources, sustainably harvested here in the U.S. We found a lumber mill who is part of the AHLA—which is the Appalachian Hardwood Lumber Association—and they have their sustainability certifications through that. They do selective logging and they don't do clear-cut logging. They just do their planting and they leave it be. So we build these things to last. The hope is, sort of like my grandparent's generation, that this could be something you could hand down. John: We even do chemical testing on all the independent components of our products. We've gone through the extra step, too, of getting our products GreenGuard certified. And essentially what this means is that you send off your products and they test them for thousands of chemicals that are known to be harmful. Our products have passed to their highest standard which is the GreenGuard Gold standard. Judd: The finishes that we use are zero VOC. They're hand-rubbed so they're not a spray application, which is very common. And another big difference is—and a lot of people notice it when they come into the shop—a lot of shops tend to smell like lacquer and paint thinner and all those things, and this shop smells like wood, which is a great way to have it. Michael: And I always felt that people who are making an organization successful, that everyone should benefit. All of the revenue shouldn't flow to the top; all the benefits shouldn't flow to one person. That kind of idea just never felt fair to me. Dominick: As an employee-owned company, we all feel a sense of responsibility and a sense of purpose to really make a product that contributes to a customer's quality of life and improves the nature of their sleep. Lay Lwin: When walking into a Savvy Rest Natural Bedroom store, you're working with an employee-owner. We take pride in everything that we do day to day. John: That's going to show through in the kind of service and product that you receive. Twila: The whole concept of being employee-owned is just a wonderful way of communicating a shared value and producing a product that we can all feel proud of. Because we all have a sense that our name is on that product. John: I can't say enough about the shared values and the shared goals. There's so much collaboration and shared excitement for what we're doing. It's not a "me first" attitude here. Dominick: And what also really feels good is the fact that everything is made right here in the United States. We're proud to be an American manufacturer. Seanan: Along the way, it's been nice to be able to wave a banner to say, "Hey, manufacturing can still work," during a time when there was a mass exodus in terms of manufacturing happening in the country. Michael: We're also part of a larger community: with our suppliers, in the communities we live and work in, within Savvy Rest itself, and with Mother Earth also. Those are ongoing relationships that have to be sustainable. And B Corp is a formal way of endorsing all those relationships. John: It stands for Benefit Corporation. B Corps are a collective group of companies out there that have made a commitment to enhance the lives of their employees, to benefit their local communities, and to engage in sustainable business practices. Twila: So being a B Corp, to me, is really about giving. Dominick: And we love to find ways to give back to our communities and give back to non-profits that are serving those communities in all kinds of different ways, whether it be a monetary donation as a portion of our sales every year, or product. Lay Lwin: As part of our social mission as a certified B Corp, Savvy Rest has come out with a Safe Sleep Pillows program. 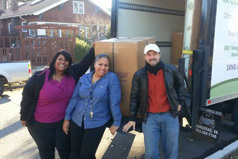 We reach out to shelters around our local community and donate pillows to people in need. Michael: And I think what we see in the business world, in general, is people trying to make money and their main goal in profit. And I think we see that in the mattress industry and I think we see it in the organic mattress industry, as well. But in a certain sense, it gives us an advantage to be radically honest and to have authentic relationships. John: It's not just profits. We legally value our environment, sustainable practices, our employees, and our local community more than shareholder value. Twila: It's really about caring for people, and that's something I can believe in. That's something I can agree with. Dominick: Our mission isn't necessarily to provide you with a mattress. Our mission is to contribute to your quality of life. We just happen to have chosen mattresses as the vehicle to do that. Pride in ownership pays big benefits to everyone—including consumers. 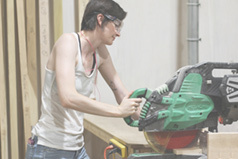 We spent an afternoon with Leah Larsen, one of Savvy Rest's talented woodworkers in Charlottesville, Virginia.